It may have been the entrance of proper autumnal weather today, it may have been Anzac Day on the horizon, whatever it was, my mind turned to chewy, oaty, golden syrupy cookies today and I had to act on it. 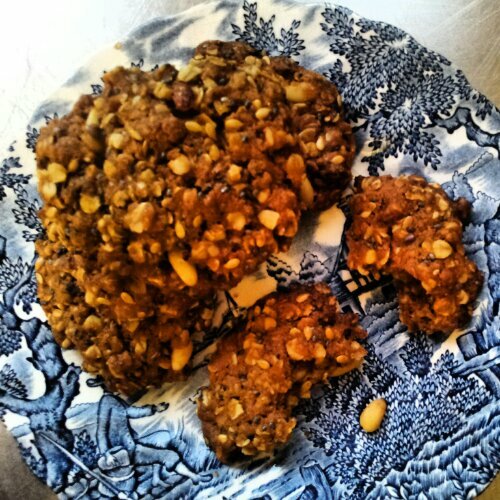 These are a take on a traditional Anzac biscuit recipe, but I’ve added goji berries, pine nuts, golden linseed and black chia seeds to make them a bit more exciting. I must admit I’m not much of a measurer in the kitchen – yes, even when baking, tut, tut…. so my measurements here are not entirely, absolutely, unquestionably exact. But bahhh, biscuits are the forgiving souls of the baking world. That’s why I’m all about the them. This recipe makes about 24 average size biscuits. -Preheat oven to 180 degrees. -In a large mixing bowl, combine 2/3 cup plain flour, 1/2 cup wholemeal flour, 1 1/4 cups rolled oats (not instant oats! ), 1/2 cup raw sugar, 1/3 cup pine nuts, 1/4 cup golden linseed, 2 Tbsp black chia seed. 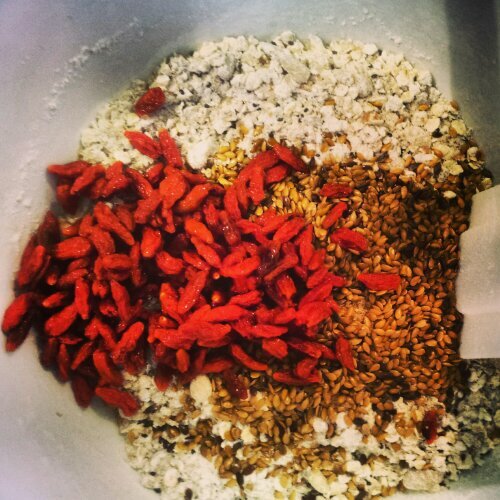 -Boil kettle and a little of the boiling water to soak 1/3 cup goji berries for a few mins until soft. -Dissolve 1 tsp baking soda in 2 Tbsp of boiling water, then stir into the melted butter and syrup – watch it go all foamy; that’s a bit exciting! -Drain goji berries and stir into flour mix, then pour in the butter mix and stir until everything is combined. It’s a pretty buttery mix, but that’s why they taste so damn good in the end….Plop spoonfuls onto a baking tray and flatten slightly. Bake for about 12-15 minutes until golden and fragrant. Remove tray from oven but don’t try to shift the biscuits yet you impatient fool! They’re a bit flimsy to start with. Let them cool just a bit then transfer to a rack to cool completely.